When British amateur astronomers Richard Carrington and Richard Hodgson independently saw a brightening of a small region of the Sun about 150 years ago, in 1859, they saw a very powerful event now called a solar flare. Since American astronomer George Ellery Hale discovered about 100 years ago that sunspots are regions of strong magnetism on the Sun, astronomers have linked magnetic storms on Earth to sunspots and to the solar-activity cycle. For roughly the last 50 years, solar flares have been categorized and detected by the x-rays they give off. The current classification of flares goes, in increasing power at their peak, A, B, C, M, X. Last Wednesday, scientists reported that they haven't been noticing most of the solar flares' energy. In a NASA Press Conference, held simultaneously with the release of a paper online in The Astrophysical Journal, they reported on new results based on observations with NASA's Solar Dynamics Observatory. Since its launch on February 11, 2010, SDO has detected over a couple of hundred solar flares with its extreme-ultraviolet measuring instrument and with its cameras that take images also in that part of the spectrum beyond the violet, the ultraviolet. (Far into the ultraviolet is known as the extreme ultraviolet.) 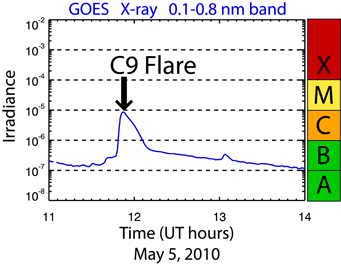 Several analyses have now shown that at least a group of the most powerful flares, which are detected in x-rays by satellites such as the GOES (Geostationary Operational Environmental Satellite) series of the National Oceanic and Atmospheric Administration, give off more energy about 90 minutes later than the x-ray peak than occurred in that first detected peak. This hitherto undetected second peak may not be quite as powerful at its maximum as the first peak but covers a somewhat longer time, rising to its peak and falling more slowly than the x-ray peak. It can thus contain more energy than the first peak.